Many offshore drilling contractors are experiencing BOP component failures on their new or recently serviced BOP drilling controls. Pressure testing of these controls and vetting their long term integrity by cycle testing to remove infant mortality helps drilling contractors assure they are putting good components on their BOP stack. The test bench can also provide a record of component performance to support accountability for repairs and supplier quality reporting. Test bench configurations are easily configured to accommodate the users test criteria. The modular test bench design allows customization of system configuration to achieve the customer’s desired test plans. Up to eight channels of digital hydraulic signatures or a simple mechanical paper chart can be provided to record test data. Panels for display and control of pressure and flow are laid out to optimize testing protocol and ease of operation. The simplicity of the modular design also lends itself to easy maintenance and serviceability. 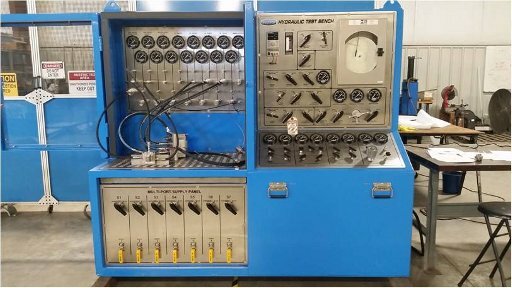 Customized brackets are secured in the test bed to hold any BOP manufacture’s control components and easily interface manifold blocks with hydraulic hoses for testing. Call or e-mail to arrange a facility tour or check out our other products on-line.